Born to the Italian nobility, Lorenzo’s family had a military history and a duty to protect the outer defenses of the city of Pisa, Italy. Lorenzo, however, was drawn to the religious life, began studying for the priesthood, and while a deacon, he joined the Dominicans at the convent of Saint Catherine in Pisa in 1396. Priest. 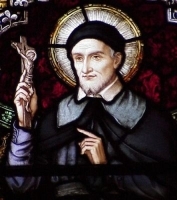 He worked for reform of the Dominicans and encouraged his brother friars in their studies, prayer life, and devotion to the Rule. Lorenzo served as novice master, spiritual director and preacher, and taught theology; his novices and students include Saint Antonius of Florence, Blessed Peter Cappuci, Blessed Fra Angelico and the artist Fra Benedetto. Vicar-general of the congregation. He worked with the sick during plague outbreaks in the Italian cities of Pistoia and Fabriano. Father Lorenzo served for 60 years, lived a simple, ascetic life, and was particularly devoted to the sacrament of Penance and Reconciliation. Born to the nobility, daughter of the Lord of Puimichel, France. Orphaned in infancy; raised by her aunt, the abbess of the convent of Saint Catherine in Sorbo. Franciscan tertiary. Married at age 16 to Saint Elzear, Count of Sarban, Franciscan tertiary, and godfather to Pope Urban V; the couple lived chastely. Became a lady in waiting to Queen Sanchia in Naples. Widow, Elzear dying of natural causes while on a trip to Paris, France. When Queen Sanchia died, she sold her vast estates, gave the proceeds to the poor, and retired to Provence where she lived her remaining years in seclusion. Born to the nobility. Nephew of William of Sabron, abbot of Saint Victor's abbey, Marseilles, France, where Elzear was educated. Franciscan tertiary. 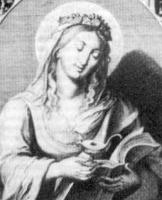 Married to Saint Delphina at age 16, with whom he lived chastely the rest of his life. Count of Ariano in Naples, Italy upon his father's death. Uncle and godfather of Pope Urban V. Tutor to the son of King Robert of Naples in 1317. Diplomat for King Robert. Died while on a trip to arrange a marriage for Prince Charles. Known especially for his happy, loving, Christian marriage and his deep personal prayer life. Priest in the diocese of Maçon, France. Imprisoned on a ship in the harbor of Rochefort, France and left to die during the anti-Catholic persecutions of the French Revolution. One of the Martyrs of the Hulks of Rochefort. Born to the nobility. 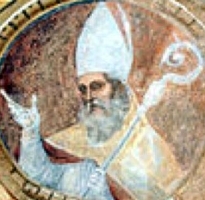 Benedictine monk and then abbot of Santa Maria di Storaco Abbey where he was known for his knowledge of the scriptures. Priest. Noted and popular preacher. 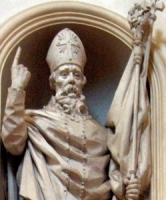 Bishop of Foligno, Italy in 1078. Pilgrim and Crusader to the Holy Lands from 1096 to 1104, after which he retired from his see to return to life as a monk. His biography was written by Saint Sylvester Guzzolini. Brothers, born to a Moorish father and a Christian mother. Martyred in the persecutions of Abderrahman II. Spiritual student of Saint Barnabas the Apostle. First century bishop of Milan, Italy for 24 years. Baptized Saint Vitalis, Saint Gervase and Saint Protase. Mercedarian. Assigned to north Africa, he was repeatedly beaten and abused by Muslims, but managed for free 121 Christians who had been enslaved by them. Recluse near Liessies, France under the spiritual direction of her brother Gundrad, abbot of the nearby monastery. Mercedarian friar known as a man wholly devoted to God. In Algiers in North Africa, he ransomed and freed 80 Christians who had been enslaved by Muslims. Seventh century spiritual student of Saint Cadoc of Wales. Hermit on an island off the coast of Glamorgan, a piece of land now known as Barry Island in his honour. Priest. Bishop of Ravenna, Italy. Monk at Saint Gall Abbey in Switzerland. Three Christians martyred with Saints Cosmas and Damian in the persecutions of Diocletian - Anthimus, Euprepius and Leontius.